Australia lies between the Pacific and Indian oceans. Its capital, Canberra, is in the Australian Capital Territory (ACT) between New South Wales and Victoria. There is one other Territory: the Northern Territory (Darwin) and six States: New South Wales (Sydney), Queensland (Brisbane), South Australia (Adelaide), Victoria (Melbourne), Western Australia (Perth) and the Island of Tasmania (Hobart). A large proportion of Australia – the interior or the outback – is desert. Although much of Australia is flat, low-lying and dry the country has its mountain ranges, rivers (e.g., Murray River), lakes and underground water reserves. Forty percent of Australia enjoys a tropical climate but snow falls in the Australian Alps which lie at the south end of the Great Dividing Range. Overall Australia has low rainfall though the eastern coastline, cut off from the dry centre by the Great Dividing Range, is green and fertile. Much of Australia’s flora and fauna are unique, left to develop in isolation, since Australia broke away from the ancient giant continent of Gondwanaland. Among the special types of animals are the marsupials and the monotremes. Almost half of the Australian mammals are marsupials – animals which carry their young in pouches: kangaroos, wallabies, wombats, and koalas. The platypus and the spiny anteater are monotremes – egg-laying mammals. Monotremes are thought to be a stage in the development of the evolution from reptiles to mammals. The dingo, Australia’s wild dog, was probably brought to the continent by Indigenous Australians who are believed to have moved down to Australia from Southeast Asia thousands of years ago. Other Australian animals are crocodiles, snakes, lizards and turtles. Birds include cockatoos, emus, kookaburras, lyrebirds, parrots and black swans. Two common trees in Australia are the eucalyptus and the acacia. There are many species of eucalyptus trees which have adapted to the varied growing conditions on the continent. The acacia (known as wattle) has also adapted well to the dry conditions. The Great Barrier Reef, the world’s largest coral reef, is a breeding ground for green and loggerhead turtles and home to humpback whales, dolphins and dugongs. Among the many fish which inhabit Australia’s surrounding waters are sharks, rays and lungfish. The lungfish is unusual because it has lungs as well as a gill breathing system. Indigenous Australians had a special relationship with the land and their environment – a “oneness” and their way of life had little harmful effect on the environment. With the arrival of Europeans, environmental problems occurred caused by land clearing, overgrazing and by the introduction to the continent of animals, such as rabbits, which have bred rapidly and become pests. 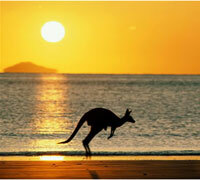 Australia is keen to protect its environment and steps are being taken to preserve the flora and fauna. 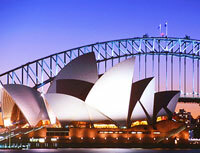 The government has designated many areas as National Parks and there are a number of World Heritage sites in Australia. Indigenous Australian culture needed no permanent structures, so the first Australian architecture was that of the colonists and the convict settlements. Canberra, the capital of Australia, was designed in the early part of the century by the American architect Walter Burley Griffin and finished in the 60s. Along with the cities’ skyscraper skylines, older stone buildings and weather-board cottages have been preserved; for instance the cobbled streets of Sydney coexisting with the most modern of designs. Modern Australian architecture is probably best known for the Sydney Opera House designed by the Danish architect Jorn Utzon. Indigenous Australians have lived in Australia for over forty thousand years, originally migrating to Australia from Southeast Asia. With the arrival of the Europeans in the eighteenth century many of the indigenous Australians died from unfamiliar diseases brought to the continent by the newcomers. Today, many have abandoned their traditional tribal way of life and live in the towns and cities. After the Second World War the Australian government promoted an immigration programme: over half of the migrants were British; others were Greeks, Germans, Dutch, Italians and Yugoslavs. Today over ninety percent of the population are of European descent; others are from Asia and the Middle East. The Australian population was estimated at 21,262,640 in 2009. English is the national language of Australia. Many Australians are Christians. There are also Muslims, Buddhists and Jews. Australia’s mixture of races has led to an exciting array of cuisine apart from the usual Australian meals of steaks, chops and roast lamb. The large Greek community, the Italians and Chinese have all brought their own cooking styles and recipes to the continent. As so many of the population live along the coast, it is not surprising to find lots of fish in the Australian diet. The outdoor life resulting from the good weather has meant that barbecues have become a national tradition. ANZAC biscuits commemorate the Australian and New Zealand Army Corps who fought in both World Wars. Another world famous Australian sweet recipe is for Pavlova which is said to have been created for the visit of the Russian ballerina, Anna Pavlova, in 1935. Indigenous Australians have their own diet based on the hunting and gathering way of life. For example, berries, witchetty grubs and roast snake and lizard.